Liquid Face Lift combines dermal and deep facial tissue fillers and botox to create a non-surgical face lift and rejuvenate the eyes creating a non-surgical eye lift and brow lift. Liquid face lift is a combination of injectable treatments, which when performed at the same time can provide extremely rejuvenating results. 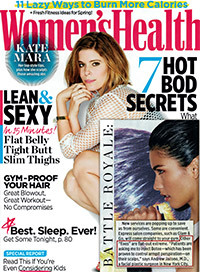 They represent a gentler alternative to a face lift by using plumping fillers and Botox. 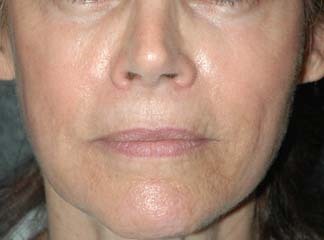 Although their results are temporary and not as dramatic as a face lift, injection cocktails are sufficient for patients in their 30s, 40s, and 50s. One of the important components of the liquid face lift, is the use of Botox to lift portions of the face. Botox The way to understand how Botox lifts the face is to understand that there is a constant tug of war going on in any section of the face. 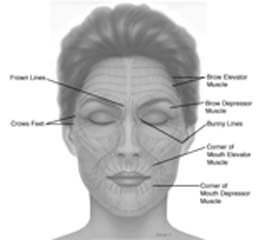 There are muscles that lift a portion of the face (for example the eyebrow) and opposing muscles that pull it down. If we inject Botox in the muscle that pulls things down, the muscle that lifts wins, and the results is that that portion of the face is lifted. This also works when injecting Botox into the muscles that pull the corner of the mouth down, causing the marionette lines to flatten as the muscles that lift this area work unopposed. Another place where Botox is used is on the paired vertical bands in the neck that run from the chin to the chest. These bands are the platysma muscle of the neck, and they are apparent because this muscle pulls down when it is tensed. It is important to use a combination of fillers at the same time, as different fillers (Juvederm™, Restylane™, Perlane™, Radiesse™) treat different surface wrinkles and folds depending upon their depth . Fillers are like spackle, they fill in lines. The type of injectable that is used is dependent upon how deep the lines and they described below. In addition to simply filling wrinkles, we now use these fillers to lift the face. As we age we lose the natural volume of our face and deflate. Filling along the jawline, into deflated cheeks, and into dark circles and hollows under the eyes can lift the jowls, cheeks and eyes resulting in a non-surgical face-lift and non-surgical eye lift. 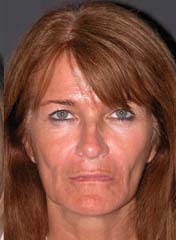 Liquid Face Lift Patient 1: Non- Surgical Face Lift using Botox and Restylane and Juvederm. Botox is used to lift the corners of the mouth Restylane was used to fill the hollows under the eyes creating a non-surgical eye lift, and the cheeks were filled with Juvederm to lift them and fill the nasolabial folds resulting in a non-surgical face lift. The smile lines are diminished and she looks natural. 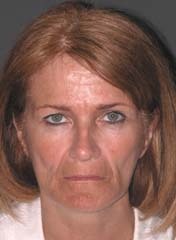 Liquid Face Lift Patient 2: Non- Surgical Face Lift using Botox and Radiesse and Juvederm. Botox is used to lift the corners of the brows and open the eyes, Restylane was used to fill the hollows under the eyes creating a non-surgical eye lift, and the cheeks and smile lines/ lipstick bleed lines were filled with Radiesse to lift them resulting in a non-surgical face lift. You laugh, your frown, and you concentrate. And over time, those expressions leave their mark upon your face. Wrinkles around the eyes (“crow’s feet”), between the eyebrows (“frown lines”), and forehead wrinkles are caused by contractions of delicate underlying facial muscles. Until today there wasn’t a lot you could do about it. Today there’s BOTOX® Cosmetic, a simple, nonsurgical procedure that can dramatically reduce even your toughest wrinkle within days by preventing these muscles from contracting. 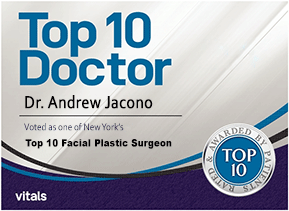 Dr. Andrew Jacono is a member of the BOTOX® Cosmetic Physician’s Network. BOTOX® injection to the frown lines between the eyebrows. BOTOX® injection to the “crows feet” around the eyes. Botox blocks the impulses from the nerves to tiny facial muscles that are related to expression lines. After treatment the muscles relax and the overlying skin remains smooth and unwrinkled. Untreated muscles still contract allowing for normal facial expression to be unaffected. Botox has been used for over ten years to treat many neurologic disorders and is safe and effective. 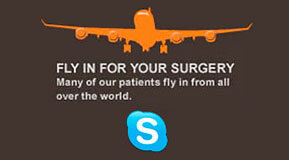 Botox injections will last approximately 3 – 5 months, and must be repeated. For more permanent improvement of frown lines between the eyebrows Doctor Jacono may suggest a surgical procedures called an endoscopic browlift. 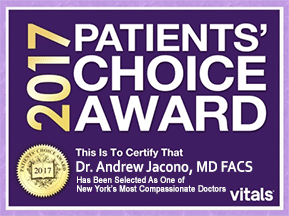 Doctor Jacono uses a tiny micro needle to precisely inject a very small amount of Botox into several locations of the face. Pain is minimal because the needle is so fine and small amounts are injected. RESTYLANE™, JUVÉDERM™ AND PERLANE™ are FDA approved hyaluronic acid (a sugar molecule) dermal fillers. Because they are completely natural and contains no animal ingredients, pre-testing for possible allergic reactions is not necessary They lasts between 6 and 9 months, and no allergy testing is necessary. These gels are injected into the skin in tiny amounts. The gel fills the skin’s wrinkles and depressions by plumping it with natural volume, bringing a rebirth of smoothness to the surface. It is often used in smile lines, marionette lines, lipstick bleed lines, in the dark eyelid circles and hollows, and to fill dropped cheeks. RADIESSE™ is presently the newest and most promising long term soft tissue wrinkle filler, with results lasting 1 to 2 years, and no reported side effects or allergic reactions. Radiesse consists of calcium hydroxyapatite, a primary component of teeth and bones, and is supplied in an injectable form which remains soft, pliable and non-calcified. FDA has approved its use in the face. It is injected into deeper folds and supports dropped parts of the face better than hyaluronic acid. It cannot be used in thin skin and around the eyes or in the lips. Restylane Patient 3: Non- Surgical eyelid lift using Restylane to fill deep under eye circles. 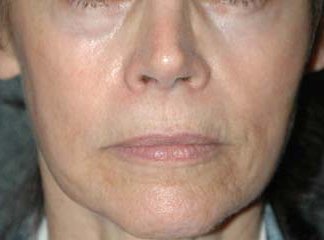 Juvederm Patient 4: Juvederm was injected into the nasolabial fold (smile lines) which rejuvenates her face.